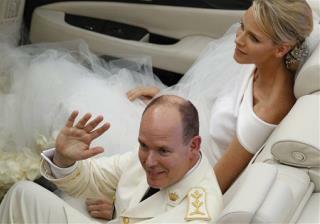 (Newser) – The bride who didn't look all that excited to wed Monaco's Prince Albert tried to flee the ultra-luxe wedding not one but three times, sources now say. Charlene Wittstock was reportedly stopped by cops just last week at an airport in France, where she was about to head to her South African home on a one-way ticket. Now pals say that was only the most recent in a string of runaway bride attempts by the Olympic swimmer, who's not too keen about her prince's wandering ways, notes the Telegraph. She even tried to seek refuge in the South African embassy in Paris while visiting there in May, but her passport was confiscated, and she was persuaded to go ahead with the ceremony. Some secretive "arrangement" was worked out that convinced Wittstock, 33, to marry the 53-year-old prince. Wow, how sad. I'd rather be poor as dirt and have a good man than richer than God and have a disrupted household. I don't know how I could ever be part of an open marriage or any arrangement like that. Poor woman - It's such a shame she couldn't manage to get out somehow. So theirs was literally a shotgun wedding?